This incredibly chic designer dog collar in Fuchsia has been handmade from gorgeous ecologically tanned Italian calf leather. Each collar is not only extremely robust and durable, but also luxuriously stylish, to compliment your lifestyle and taste. Each Collar has been designed to perfectly match the Saffiano Dog Leash in Chocolate, Fuchsia and Baby Blue. 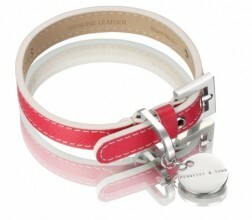 All dog collars in this collection are handmade in Switzerland and feature water resistant French alsavel lining. All metal components are made from high quality 316L stainless steel for unsurpassed durability and beauty which is 100% anti-allergenic and nickel free. This collar is also also available in Baby Blue and Chocolate. Hennessy & Sons hand crafts its luxury dog collars and leads in Switzerland from the finest materials using only ecological tanned leather from strictly selected traditional European tanneries. The company also donates 2% of its profits to International Animal Rescue as part of the company’s continuing commitment to animal welfare.